As protestrs call for action, families fear letting sick relatives get care. As the number of new infections and deaths rise in the Ebola outbreak, fear and suspicion is rising, too, making it more difficult for health care workers to get the sick into hospitals, even as increasingly angry crowds are calling for more government action. The growing chaos caused by this current Ebola outbreak, which is already the worst on record with more than 1,300 infected and 700 dead in three countries in West Africa, was witnessed by ABC News in Clara Town, a low income community in the Bushrod Island area of Monrovia. On UN Drive, a car with police in riot gear slowly crossed the Gabriel Tucker bridge to go onto Bushrod Island. Some minutes later, those officers were standing on a median looking at a group of mostly young men holding homemade signs that read, "Govt please come to our aid in Clara Town"
The men explained that community members had called the Health Ministry to come pick up the body of a man who had been dead in his home since Thursday. Late Friday or early Saturday, a woman had died in the same neighborhood, and she was also still in her home. 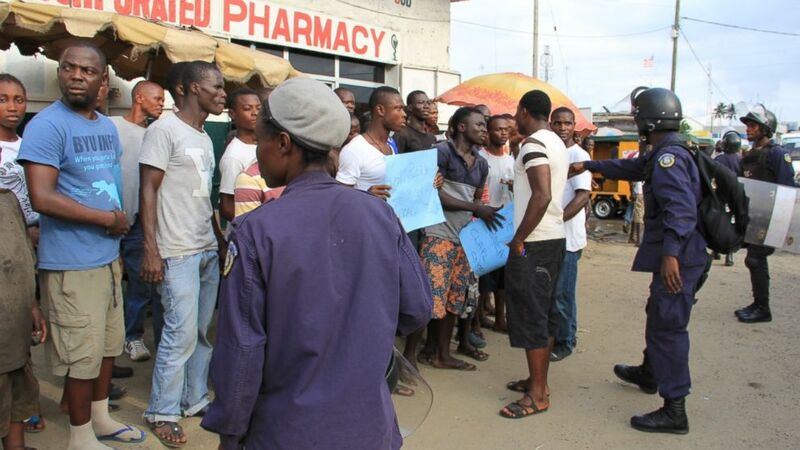 Both were suspected Ebola deaths, and the protesters wanted the government to remove them. A man in the crowd said that since they called the government on Thursday, workers had come to examine the scene, but they had not returned. He said that if the government did not respond to the request of community members to remove the bodies, there would be serious consequences. "From Monday, the entire Clara Town will be right here. No car will go into town, trust us," he said. UN Drive is a hub of activity, and it is the main road that leads from many different parts of Bushrod Island into central Monrovia. Fred D. Weah, a young man who seemed to be a leader of the group, led chants about the youth of Clara Town protecting their neighborhood and not being afraid of the police. The protesters chanted about not wanting any brutality, but said they would return it if it was inflicted upon them. 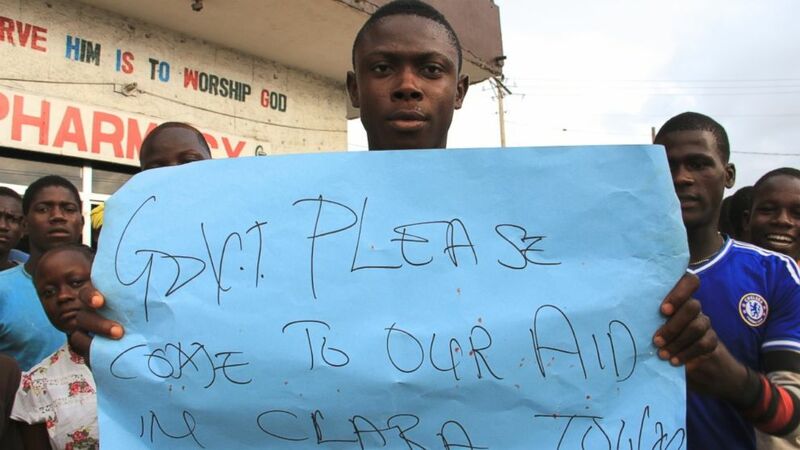 (Carielle Doe/ABC News) A young man holds a sign at a protest about the delayed removal of a suspected Ebola victim who had died in Clara Town, Liberia, on Thursday. On Saturday morning, community members learned that the dead man's neighbor had also died. As the chants got louder and the group got bigger, the riot police crossed the street and asked the protesters to move back from the road and onto the sidewalk. Some of them yelled at the police, but they moved back onto the sidewalk. A protester said that he and the others were standing on the road because Liberian President Ellen Johnson Sirleaf had driven that way and they wanted to draw attention to what was happening in Clara Town. (Carielle Doe/ABC News) Liberian police in riot gear ask protesters in the Clara Town section of Monrovia to step back onto the sidewalk. When they heard that an ambulance had arrived in Clara Town, the group moved down UN Drive and turned onto a dirt road. The women in the Clara Town market looked on as protesters and journalists walked down the road towards the neighborhood where the two people had died. Dozens of people stood on both sides of an ambulance, watching as two health care workers put on protective suits. They painstakingly checked and rechecked their suits and their disinfecting equipment, and they left the group, spraying the dirt as they walked the narrow path between houses. They passed a small concrete house with a yellow wooden window, and stopped to recheck their gear at a forest green home on the left. A young man said that those were the homes of the dead. The health care workers joined three men waiting outside of the house and as the men stood back, the workers knocked on the red metal door. Someone opened the door and the workers spoke to the person. After some time, the people in the house closed the door and the workers turned away. As the health care workers were walking away, a man in a white shirt with blue stripes told someone on the phone that the health workers could not do anything to make the sick people leave the home, and that of course they would be afraid to attempt to forcibly remove them. "They said they are afraid, they'll not feed them. That's the rumor coming," said Ezekiel Kumeh, the man in the striped shirt. "People say they're not feeding them, they're not eating, you know? So they say if they go there they will die from hunger." Well-meaning government and aid workers have said they have been attacked on trips to collect potential Ebola victims from their communities. Though rumors make it difficult and dangerous for aid workers to do their jobs, one of them has even been repeated among health care professionals. A nurse who wanted to remain nameless said she has heard from other nurses that some staffers avoided an Ebola patient in a Monrovia hospital and he starved to death. This would be difficult to confirm, but the rumor of death by starvation has spread widely. Back in Clara Town, the health care workers stood near the red metal gate and convinced Kumeh that Ebola patients in the treatment centers receive three meals a day, so he said he would go back and talk to the people in the house, his sister, brother, and a family friend. He went back to the house and tried to get the people inside to open up. Nobody opened the door and when Kumeh finally asked if they would be okay and if he should leave, he paused, heard an answer, and then said, "Isaac, I want to hear your voice." A male voice responded in muffled tones and Kumeh replied, "No, they say they're carrying you all to the hospital." The person inside the house then said, "No." Kumeh frowned and said, "Annie, I don't like what you all are doing, I don't like what you're doing to me." With a metal door blocking his way, Kumeh eventually gave up and yelled, "All right, the people are going." About 20 meters from the house, Kumeh said, "They're in there and for me I can't even go there." "There's a boundary between they and I so there's nothing I can do," he said. "It's not easy. Lost mother, lost a cousin, and then brother and sister are almost at the point of death and they're refusing to go seek medication. ... We're just going to leave it with God, there's nothing we can do more than this." He pursed his lips and looked at the ground. Near the open area in front of the homes that held the dead, a small crowd of people had gathered to find out what was going on. The health workers and Kumeh explained what had happened. "This is government business," an elderly man said. "If they stay here, they will make plenty [of] people sick." On Tuesday, at the second meeting of the Ebola Task force created by President Sirleaf last weekend, people raised concerns about the slow retrieval of bodies of Ebola victims. What happened in Clara Town on Saturday served as evidence that the collection of bodies is still a problem. When community members saw that the health care workers had returned to the ambulance empty-handed, the scene quickly descended into chaos. Medical workers looked on as young men placed tables in front of their truck and told them that they would not allow them to leave. The crowd had grown, and though most of the people there were quiet onlookers, there was a group of angry young men who loudly insisted that something happen. "This car will not leave here without carrying anybody," one man said. (Carielle Doe/ABC News) After a Liberian Ebola response team tried and failed to convince three potential patients to go to a treatment center with them, protesters blocked the ambulance and insisted they would not allow the team to leave without the sick people or dead bodies of two other Ebola victims. Another man told the health care workers that they either take the bodies or the sick, but they would not be permitted to leave Clara Town empty-handed. The men who had stood on UN Drive and said they wanted a peaceful protest tried but could do little to calm the angry group who had blocked the path of the ambulance. The health care workers occasionally tried reasoning with the crowd, and at other times they just sat in their vehicle, unable to drive away. These men were now bearing the brunt of a community's frustration with a government many said they felt wasn't doing enough to protect them from a deadly virus. In the past week, the government of Liberia has begun to enact some solid measures to contain the virus that has been spreading for months. Last Sunday, President Sirleaf held the first meeting of a National Ebola Task force. In the second task force meeting last Tuesday, many attendees said that the fight against Ebola could only be won by a joint effort of the affected countries and the larger international community. "It really is beyond the capacity of the government of Liberia to control this outbreak," said a high-level diplomat at the Tuesday meeting. With more than 700 dead, the current Ebola epidemic is the largest to date, according to the World Health Organization. The containment of this outbreak is proving to be a seemingly insurmountable task for the government of Liberia to handle on its own. Because hospitals were the locations in which the Ebola virus seemed to be spreading the most easily, some of them have temporarily shut their doors to the public. As of Saturday, two out of four of Liberia’s major hospitals - John F. Kennedy and Saint Joseph’s Catholic Hospital - are no longer accepting patients and some smaller clinics have shut down as well. There are reports that the ELWA hospital emergency room was temporarily closed. The closures have dealt a severe blow to Liberia’s already struggling health system, leaving many citizens of Monrovia concerned about where they could go for emergency care. For now, smaller clinics and hospitals are bearing the weight of treating the country's citizens. President Sirleaf has appealed for help from the international community, and in a speech on Wednesday, Sirleaf announced the creation of a National Action Plan that would mobilize the Liberian government to curb the spread of Ebola. “We have announced a number of stringent preventive measures, issued standing orders to our security forces and restricted movements internally and externally. We will continue to do more as the situation requires,” she said. Sirleaf requested that people avoid gathering in large groups, as that is a means by which the Ebola virus could potentially spread. But on Saturday evening in Clara Town, in response to what many deemed the government's sluggish response to their request, the community members did just that. "You're protected more than me," a man yelled repeatedly at a health care worker. Later, the same worker tried to talk to another man and told him, "Your patient locked the door, how do you expect us to enter?" The man replied that the Ebola team should have called the police. "There's an iron gate there, you're not expecting us to burst the door," the worker argued. As the light began to fade in Clara Town, the worker expressed frustration about the fact that this incident was preventing him from doing his job. "We've got so many cases all over. They're calling us," he said. This type of situation can have a multiplying effect, as delays such as this one could cause health care workers to miss other appointments and cause other community members to become incensed and react in ways similar to the people of Clara Town. At the Task Force Meeting on Tuesday, a senior official from the Ministry of Health said that citizens contribute to the problem of the slow retrieval of bodies in another way because they call the Ministry to pick up the bodies of people who haven’t died from Ebola, and this distracts the removal teams from their actual mission. 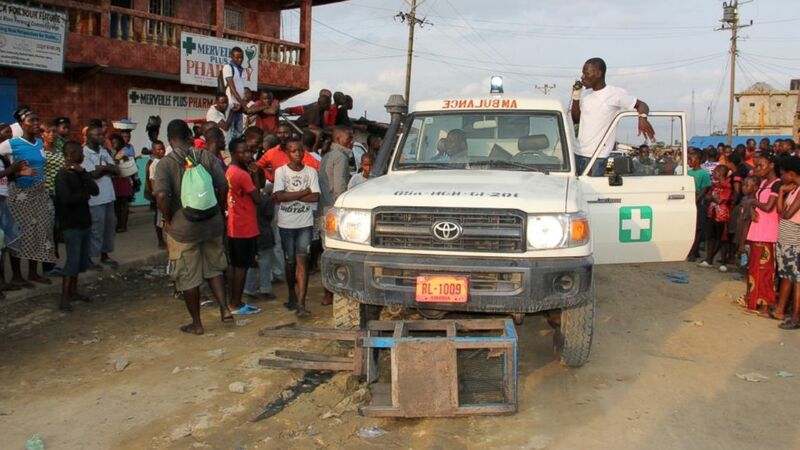 Amidst the noise in Clara Town, the health worker who had tried to reason with the crowd said he had called the Ministry of Health and that they were sending a vehicle to pick up the two bodies.